Meadow Gold Pass-O-Guava Nectar in a glass on the lanai. One must always keep a carton in the hotel mini-fridge. I adore Hawaii. I love the sunshine, the people, the atmosphere, and the effortlessly tropical/Polynesian/Asian/American melange of the place. I’ve been to Hawaii often enough to know what I’m missing when I’m not there. And what’s just about the first thing I do after I arrive on the long-haul flight from Canada? I grab a copy of the Honolulu Star Advertiser and a cold glass of Meadow Gold’s Pass-O-Guava juice. To me, it just tastes like Hawaii. Guava juice is everywhere in the islands, and passion fruit concoctions are just about as common. Both flavours are a little more alien than a lot of other tropical fruit in my corner of Canada, so I get my fill while I’m in the tropics. 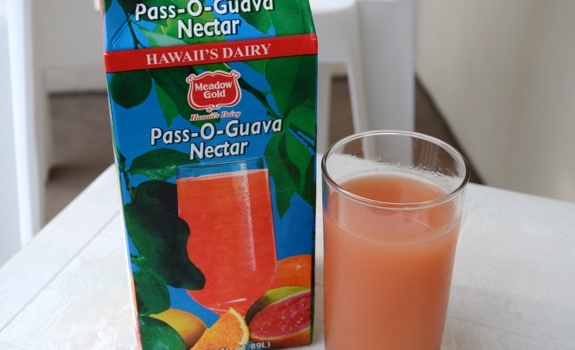 As for Meadow Gold’s Pass-O-Guava juice, it’s thick, smooth, sweet, refreshing and natural tasting. Guava leads the charge, followed by passion fruit, then orange juice. It’s a perfect fusion of flavours. I love the gritty texture that slides around on your tongue. It’s got a great mouth-feel. The dark side? The label says it contains 15% juice. (Really? Only 15%? Hunh.) There’s also “High Fructose Corn Syrup and/or Sugar” listed in the ingredients. The nutrition info panel reveals a whole lot of carbs without much vitamin to back it up. But that won’t deter me. I love the stuff, and I’ll keep drinking it when I’m in Hawaii. But I have a sinking feeling it’s not as good for me as I want to believe it is. Cost: About $2.80 per 1.89 litres (a half-gallon) at the ABC Store. Less elsewhere. Value for cash money: Great for this much delicious juice. Nutrition? : 110 calories per 240 ml. There’s a bit of vitamin C. If you’re looking for nutritional benefit, you’d be better off eating the fruit and skipping the juice. The verdict: Very, very good. I live in Las Vegas. I just noticed that they have an ABC store in one of the casinos here. First thing that popped in my head was the GUAVA JUICE… I went to Hawaii a few times now and as soon as I land, I go straight to the ABC store and get that delicious juice. It’s funny how you mentioned the same thing. So anyways, I called all the stores here and no one carries this specific brand of guava juice. Someone please help me, tell me where I can get this yummy juice. I’ll pay 10x more than what it’s worth. Hell, I’ll pay $20 a carton. It’s that damn GOOD!!!! Hmmm. Given Hawaii’s connection to Vegas (it’s a hugely popular vacation spot for Hawaiians), I’d think someone in town might know if it’s available locally.